I have no manifesto, but I do have a mission: To eat, drink, and spread the wealth, so to speak, of my experiences. I am determined to interpret this vague and self-assigned mandate as broadly as possible. In part, that is because I get bored easily. I don't like conventional limits. So I write about food festivals, sausage stands, coffee houses, and yes, specialty food shops. In the past, I've done posts about Cheesy, Thai's Asian Food Shop, Aromi La Bottega, and a number of others. 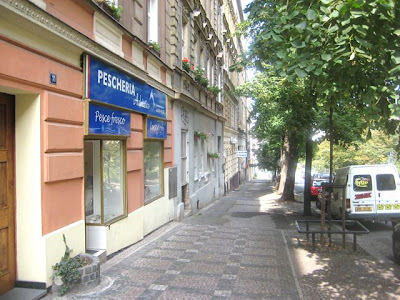 Now, I'll tell you about Pescheria Adriatico, a new fish shop in Žižkov. I was tipped off by a trusted source, my neighbor, Pivobud. He was pretty excited. Having a place that sells fresh fish in this part of town would save much traveling, if not money. One of the few other purveyors of good quality stuff, SeafoodShop, is down on Zborovská in Prague 5 -Malá Strana. There's another outlet in the Palladium shopping mall. They are not cheap. They are not close. The fish is currently delivered every Friday morning, so Friday's or Saturday morning (even though they have no posted hours for Saturday) is the best time to go. Avoid Thursdays unless they get more delivery days. There were two gentlemen who seem to be running the place. One is an Italian who apparently speaks French and some broken English, and a Czech guy who gave a lot of details about the shop. 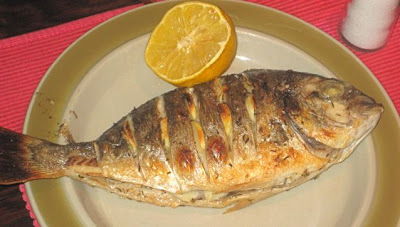 It appears they are supplying some restaurants with their catch. Pivobud saw a leaflet for Pescheria Adriatico on the counter at Osteria da Clara. 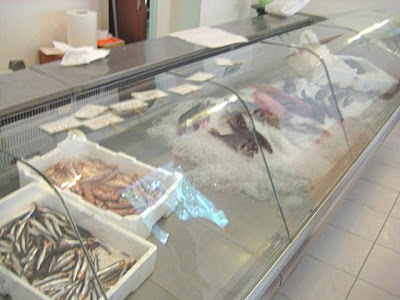 Since they're connected with the Adriatic fishing community and bring their fish from an Italian coastal market, you can special order anything you want. You just have to let them know by Tuesdays and be willing to spend at least 500 CZK. On my visit there, I picked up a dorade for V (400 CZK/kilo). This beautiful, clear-eyed fish cost 170 CZK. V prepared it by slicing its sides, stuffing the cuts with cloves of garlic, then coating it with olive oil, salt and rosemary. She cooked it under our oven's broiler. The flesh was pronounced delicate and delicious. Not fishy at all. 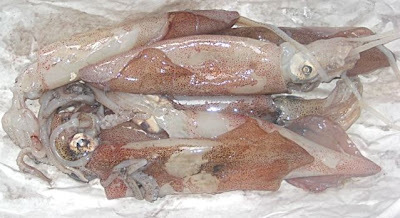 V told me that if I bought calamari, she'd clean and cook them (630 CZK/kilo). I jumped at the offer. I got all they had left in the shop, just a third of a kilo. The cost was 223 CZK. I soaked them in milk. Then, after a dusting of flour, salt, and pepper, I flash fried them. They came out golden and delicious. 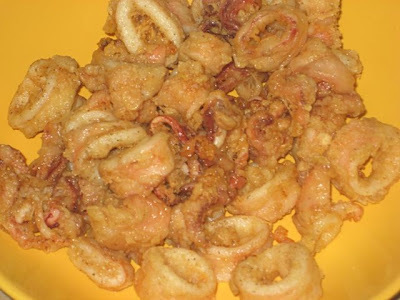 They were not as buttery soft as calamari I've had in the USA. These were more firm and had a bit of snap to the flesh. But the taste was clean and light -- excellent along with some chili dipping sauce. 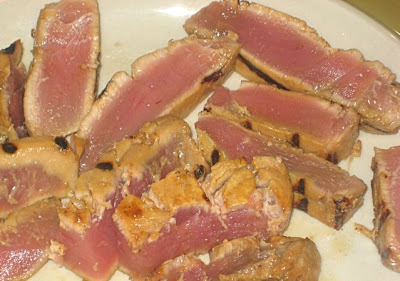 I didn't think the calamari would be enough for me, so I indulged and bought a slice of Pescheria's wonderful-looking tuna (1250 CZK/kilo). This filet cost me 253 CZK. I compared the price with the fish shop in Palladium, and they were almost the same. So, no great bargain here. 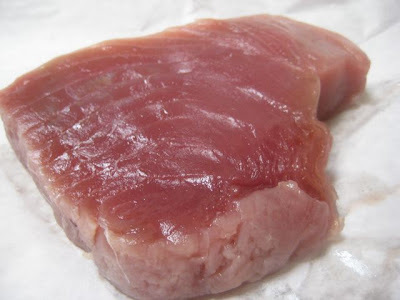 I got the first cut from the middle of a long piece of tuna, so it was really pristine -- a beautiful ruby red. 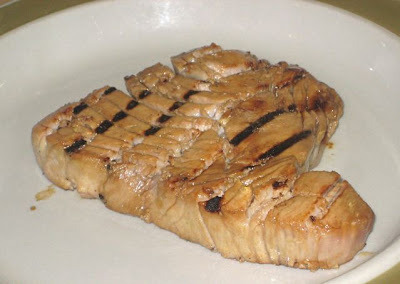 I marinated it in soy sauce mixed with wasabi and lightly seared it on my cast iron grill. It picked up a sweet, smoky flavor along with some black stripes. Then, I sliced it up, and dipped the pieces in soy sauce mixed with wasabi. My presentation could use work, but the flavor, which is what really counts, was perfect. I'm not a big expert on what fish markets charge, but Pivobud called it "the best value for money in town." 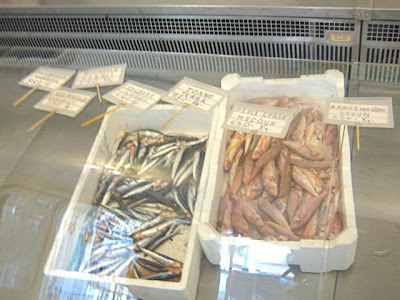 His bill for four medium-size sea bass, almost two kilos, along with half a kilo of peeled shrimp, and 10 fresh anchovies, cost slightly under 1300 CZK. He thought his catch that day would've cost double somewhere else. Since neither of us knows a good place to fish in this particular part of Prague, I think there will be plenty of people for Pescheria Adriatico to sell to. They just need to expand their offerings and get more regular deliveries. A wonderful business opportunity, I'd say. Great! Staying around the corner I hope to check it this Friday. Thanks! Thanks for the post! Unfortunately I live a good distance away from Vinohrady or Zizkov, so I tend to drift toward Ujezd for the good Market on the corner for produce.... and take a walk toward Andel for the best Butcher shop I've stumbled across and also a Cheesy (as you mentioned in a separate post). Always on the hunt for good, cheap, ingredients. Joel, if you mean the U arbesa butcher shop on Arbesovo namesti, I fully concur.